By default, when you are connected to an Exchange server, when you send a message it is sent from your machine to the recipient immediately. However if you are in the habit of writing an email message, sending it then wishing that either you hadn't or wanted to reword the content, you might like to consider delaying your email leaving your machine. If you change the options indicated, you will need to setup an automatic send/receive otherwise you will not receive new email. Then click on the "Mail Setup" tab. In the middle of the screen you should see "Send Immediately When Connected". Deselect that option. If you just want to delay your messages being sent by a few minutes, then you should adjust the automatic send/receive options. If you don't, then you will need to click on "Send/Receive" at the top of Outlook to get new messages. Next to "Send Immediately When Connected" there is a button labelled "Send/Receive..." If you click on it you will get a dialogue similar to below. 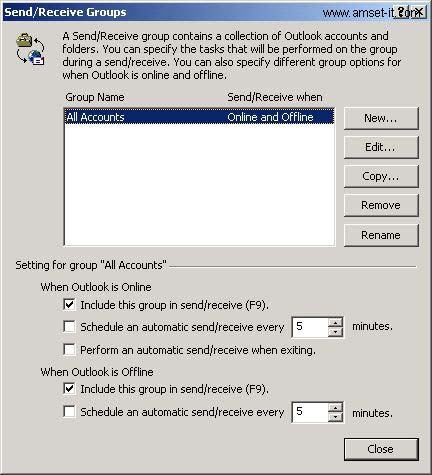 Enable the second option under "When Outlook is Online" labelled "Schedule an automatic send/receive every x minutes. Adjust the time to your preference. You may also want to enable the third option, although if there are messages waiting to be sent you will get a message when you attempt to exit Outlook. These options can also be used to keep your Offline folders up to date. More information on setting up offline folders can be found here.